Impressive at the 2017 World Junior Championships, when in the Boys’ Team event, on more than one occasion he won the vital contests that secured a place for Japan in the final; on Wednesday 6th June at the Seamaster 2018 ITTF World Tour Lion Japan Open in Kitakyushu, once again Yuta Tanaka was in the spotlight. Winner of the Under 21 Men’s Singles title last month at the ITTF Challenge Thailand Open, the 17 year old, after having beaten Korea’s An Junyeong (7-11, 11-7, 7-11, 11-5, 13-11, 11-8), caused a major upset by overcoming Portugal’s João Geraldo (11-6, 11-7, 5-11, 11-6, 11-7). Presently on the Men’s World Rankings, João Geraldo is listed at no.91, Yuta Tanaka is named at no.331. Success for Yuta Tanaka but the biggest upset of the day in the Men’s Singles qualification tournament was that caused by Korea’s Hwang Minha. Winner of the Boys’ Singles title at the 2014 ITTF World Cadet Challenge in Barbados and presently world ranked no.350, he beat Hong Kong’s Jiang Tianyi, listed at no.63 and the winner on the ITTF World Tour in Brazil in 2008 and in Hungary in 2015. Imposingly, Hwang Minha won in five games (7-11, 11-2, 11-2, 118, 12-10). 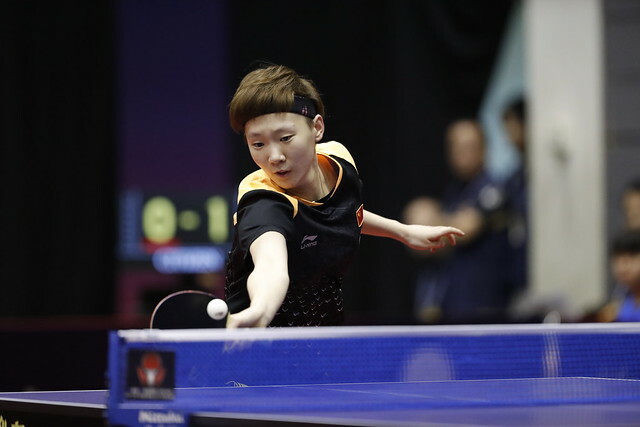 Success for Hwang Minha contrary to ranking, it was the same colleague Choi Inhyeok, as it was for Germany’s Qiu Dang as well as for China’s Yu Ziyang and Zhou Kai. Choi Inhyeok and Qiu Dang both defeated host nation adversaries. Named at no.457, Choi Inhyeok overcame Japan’s Yuto Kizukuri, ranked no.89 (7-11, 14-12, 2-11, 10-12, 13-11, 11-9, 11-4); Qiu Dang, listed at no.248, resisted a brave recovery by Yukiya Uda who stands at no.248 (11-4, 11-8, 11-8, 8-11, 7-11, 7-11, 11-9). Meanwhile, Yu Ziyang, the 2014 World Junior champion but with no current global status, beat Sweden’s Anton Källberg, rated at no.77 (11-3, 8-11, 11-3, 11-7, 11-8); Zhou Kai stifled the aspirations of Hong Kong’s Ng Pak Nam (11-4, 14-12, 11-1, 11-2). Presently on the World Rankings, Zhou Kai is at no.210, Ng Pak Nam at no.68. Defeat for Ng Pak Nam but there was success for his colleague, Ho Kwan Kit, as there was from the other leading names as play in the second round of the Men’s Singles qualification tournament concluded. Furthermore, for Ho Kwan Kit, he succeeded against an opponent of whom we may well hear more of in the future; he beat the host nation’s Sora Matsushima (11-6, 11-9, 11-7, 15-13), the young man who is only 11 years old. Success for Ho Kwan Kit; similarly of the other principal names as the round concluded, Lim Jonghoon beat colleague Cho Daeseong (6-11, 11-6, 11-8, 11-6, 11-8), Japan’s Masataka Morizono accounted for Chinese Taipei’s Feng Ti-Hsin (11-3, 9-11, 11-8, 11-6, 11-4), the latter’s Liao Cheng-Ting ended the hopes of Thailand’s Padasak Tanviriyavechakul (9-11, 11-8, 11-6, 11-9, 11-5). Play in the Men’s Singles qualification tournament concludes on Thursday 7th June.